Download "DOCTOR OF PHILOSOPHY DEGREE. 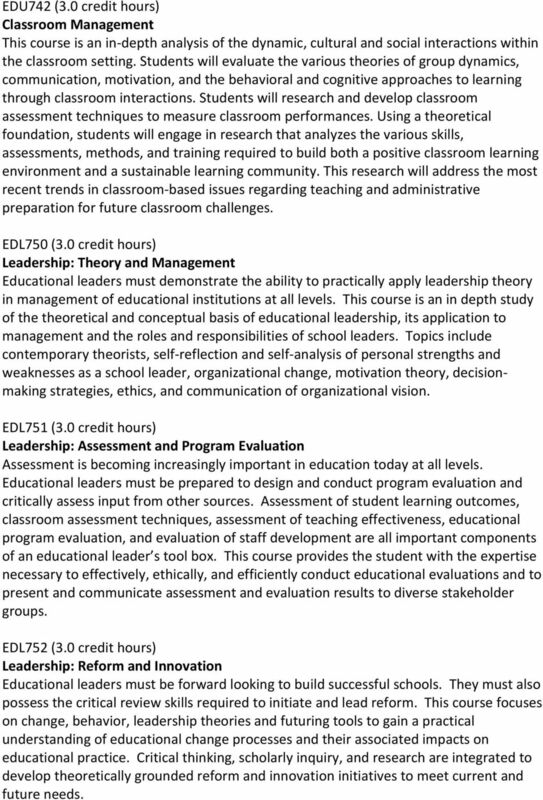 Educational Leadership Doctor of Philosophy Degree Major Course Requirements. EDU721 (3." 2 theory forms the basis for using technology in the classroom and will be applied to assessing technological resources and innovation. Course topics include: instructional delivery using multimedia, matching technologies to outcomes, cost and funding of technology, and trends in instructional technology. Risks and threats with the wide availability of media (the internet, ipods, cell phones, and others) to classroom security and ethical student behavior are assessed and evaluated. EDU722 (3.0 credit hours) Management of Distance Education This course gives educational leaders the skills and competencies to administer, manage, and lead distance education programs. Topics include managing existing programs, design and implementation of distance education programs, marketing distance education programs, and improving existing programs for efficient and effective delivery. From a research perspective students appraise the role of the course room facilitator, evaluating course room instruction, and assessing course room security and achievement of learning outcomes. Issues and policies related to distance education ethics, security, and acceptance are addressed. EDU730 (3.0 credit hours) Funding of Educational Institutions This course examines public and private funding for educational institutions. Course topics include regulatory issues relating to funding, the role of politics in education funding, present and future funding patterns and school finance reform. 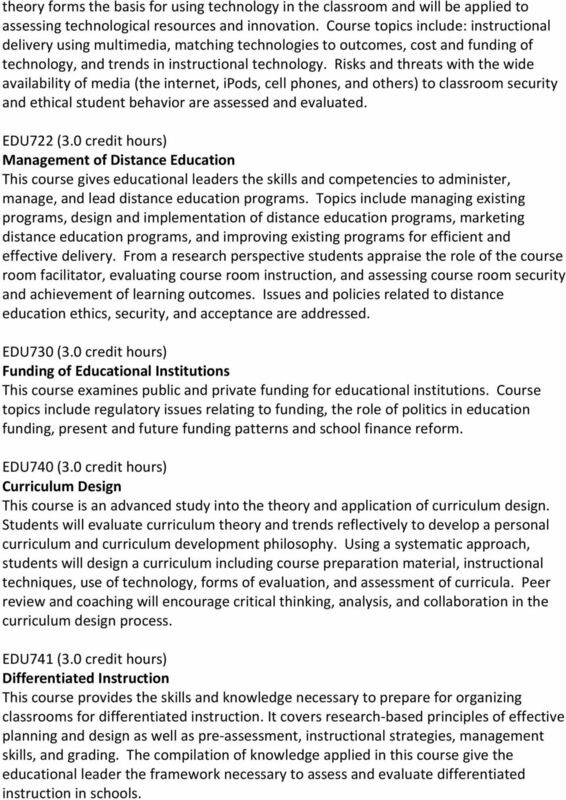 EDU740 (3.0 credit hours) Curriculum Design This course is an advanced study into the theory and application of curriculum design. Students will evaluate curriculum theory and trends reflectively to develop a personal curriculum and curriculum development philosophy. Using a systematic approach, students will design a curriculum including course preparation material, instructional techniques, use of technology, forms of evaluation, and assessment of curricula. Peer review and coaching will encourage critical thinking, analysis, and collaboration in the curriculum design process. EDU741 (3.0 credit hours) Differentiated Instruction This course provides the skills and knowledge necessary to prepare for organizing classrooms for differentiated instruction. It covers research based principles of effective planning and design as well as pre assessment, instructional strategies, management skills, and grading. The compilation of knowledge applied in this course give the educational leader the framework necessary to assess and evaluate differentiated instruction in schools. 3 EDU742 (3.0 credit hours) Classroom Management This course is an in depth analysis of the dynamic, cultural and social interactions within the classroom setting. Students will evaluate the various theories of group dynamics, communication, motivation, and the behavioral and cognitive approaches to learning through classroom interactions. Students will research and develop classroom assessment techniques to measure classroom performances. Using a theoretical foundation, students will engage in research that analyzes the various skills, assessments, methods, and training required to build both a positive classroom learning environment and a sustainable learning community. This research will address the most recent trends in classroom based issues regarding teaching and administrative preparation for future classroom challenges. EDL750 (3.0 credit hours) Leadership: Theory and Management Educational leaders must demonstrate the ability to practically apply leadership theory in management of educational institutions at all levels. This course is an in depth study of the theoretical and conceptual basis of educational leadership, its application to management and the roles and responsibilities of school leaders. Topics include contemporary theorists, self reflection and self analysis of personal strengths and weaknesses as a school leader, organizational change, motivation theory, decisionmaking strategies, ethics, and communication of organizational vision. EDL751 (3.0 credit hours) Leadership: Assessment and Program Evaluation Assessment is becoming increasingly important in education today at all levels. Educational leaders must be prepared to design and conduct program evaluation and critically assess input from other sources. Assessment of student learning outcomes, classroom assessment techniques, assessment of teaching effectiveness, educational program evaluation, and evaluation of staff development are all important components of an educational leader s tool box. This course provides the student with the expertise necessary to effectively, ethically, and efficiently conduct educational evaluations and to present and communicate assessment and evaluation results to diverse stakeholder groups. EDL752 (3.0 credit hours) Leadership: Reform and Innovation Educational leaders must be forward looking to build successful schools. They must also possess the critical review skills required to initiate and lead reform. This course focuses on change, behavior, leadership theories and futuring tools to gain a practical understanding of educational change processes and their associated impacts on educational practice. Critical thinking, scholarly inquiry, and research are integrated to develop theoretically grounded reform and innovation initiatives to meet current and future needs. 5 as interviewing techniques, field observation, content analysis, historical analysis, focus groups, and questionnaire design. Qualitative data collection and analysis techniques are applied to research questions with a focus on understanding phenomenon in education not resolved by other research methodologies. Educational decision making and research methodologies for expanding the body of knowledge are developed and applied. 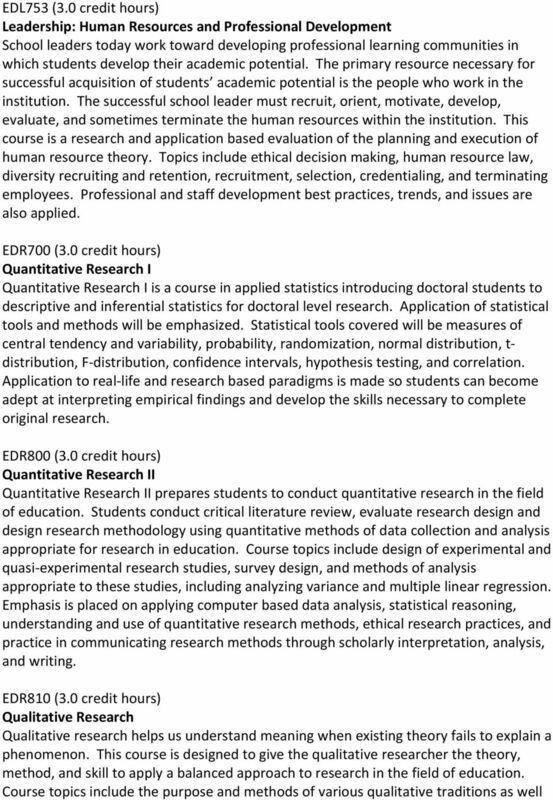 EDR811 (3.0 credit hours) Mixed Methods This course provides students with an understanding of mixed methods (qualitative and quantitative) approaches to research studies. Appropriate strategies for incorporating both quantitative and qualitative paradigms will be explored. Specific issues, challenges, and considerations encountered in using mixed methodologies will be addressed in detail. The conflict between positivism and constructivism will be investigated, as will various examples of mixed model designs applicable to educational leadership. While there are pragmatic advantages to combining qualitative and quantitative methods, it is important to know that there are philosophical debates about combining these distinct approaches. Students need to understand the paradigmatic backgrounds of each approach and how to deal with these paradigm differences to answer real world research questions. 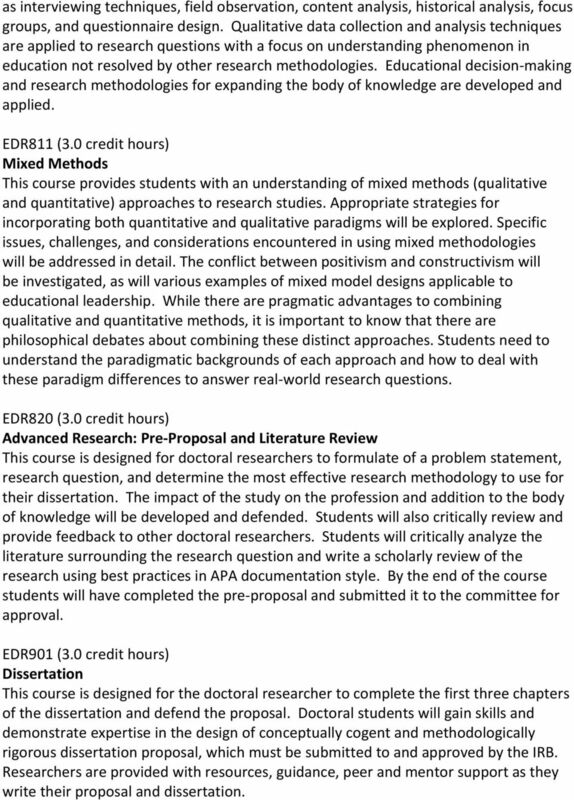 EDR820 (3.0 credit hours) Advanced Research: Pre Proposal and Literature Review This course is designed for doctoral researchers to formulate of a problem statement, research question, and determine the most effective research methodology to use for their dissertation. The impact of the study on the profession and addition to the body of knowledge will be developed and defended. Students will also critically review and provide feedback to other doctoral researchers. Students will critically analyze the literature surrounding the research question and write a scholarly review of the research using best practices in APA documentation style. By the end of the course students will have completed the pre proposal and submitted it to the committee for approval. 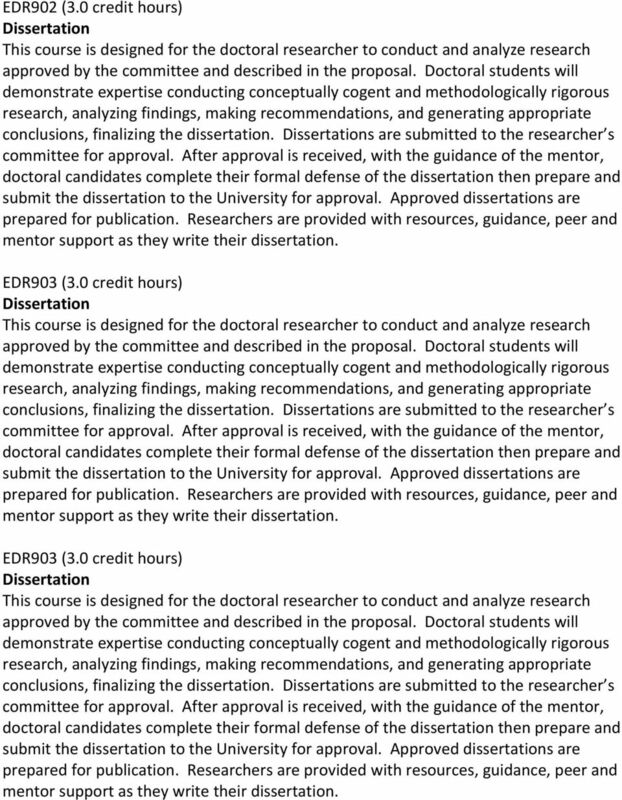 EDR901 (3.0 credit hours) This course is designed for the doctoral researcher to complete the first three chapters of the dissertation and defend the proposal. Doctoral students will gain skills and demonstrate expertise in the design of conceptually cogent and methodologically rigorous dissertation proposal, which must be submitted to and approved by the IRB. Researchers are provided with resources, guidance, peer and mentor support as they write their proposal and dissertation. 6 EDR902 (3.0 credit hours) This course is designed for the doctoral researcher to conduct and analyze research approved by the committee and described in the proposal. Doctoral students will demonstrate expertise conducting conceptually cogent and methodologically rigorous research, analyzing findings, making recommendations, and generating appropriate conclusions, finalizing the dissertation. s are submitted to the researcher s committee for approval. After approval is received, with the guidance of the mentor, doctoral candidates complete their formal defense of the dissertation then prepare and submit the dissertation to the University for approval. Approved dissertations are prepared for publication. Researchers are provided with resources, guidance, peer and mentor support as they write their dissertation. EDR903 (3.0 credit hours) This course is designed for the doctoral researcher to conduct and analyze research approved by the committee and described in the proposal. Doctoral students will demonstrate expertise conducting conceptually cogent and methodologically rigorous research, analyzing findings, making recommendations, and generating appropriate conclusions, finalizing the dissertation. s are submitted to the researcher s committee for approval. After approval is received, with the guidance of the mentor, doctoral candidates complete their formal defense of the dissertation then prepare and submit the dissertation to the University for approval. Approved dissertations are prepared for publication. Researchers are provided with resources, guidance, peer and mentor support as they write their dissertation. EDR903 (3.0 credit hours) This course is designed for the doctoral researcher to conduct and analyze research approved by the committee and described in the proposal. Doctoral students will demonstrate expertise conducting conceptually cogent and methodologically rigorous research, analyzing findings, making recommendations, and generating appropriate conclusions, finalizing the dissertation. s are submitted to the researcher s committee for approval. After approval is received, with the guidance of the mentor, doctoral candidates complete their formal defense of the dissertation then prepare and submit the dissertation to the University for approval. Approved dissertations are prepared for publication. Researchers are provided with resources, guidance, peer and mentor support as they write their dissertation. Georgia Southern University 1 Department of Curriculum, Foundations, and Reading The Department of Curriculum, Foundations, and Reading provides a service function to all other programs in the College. Instructional Delivery Model Courses in the Ph.D. program are offered online. Program Identity: The EdD in Educational Leadership advances critical inquiry for deliberate intentions. DOCTOR IN EDUCATION COURSE DESCRIPTIONS A. 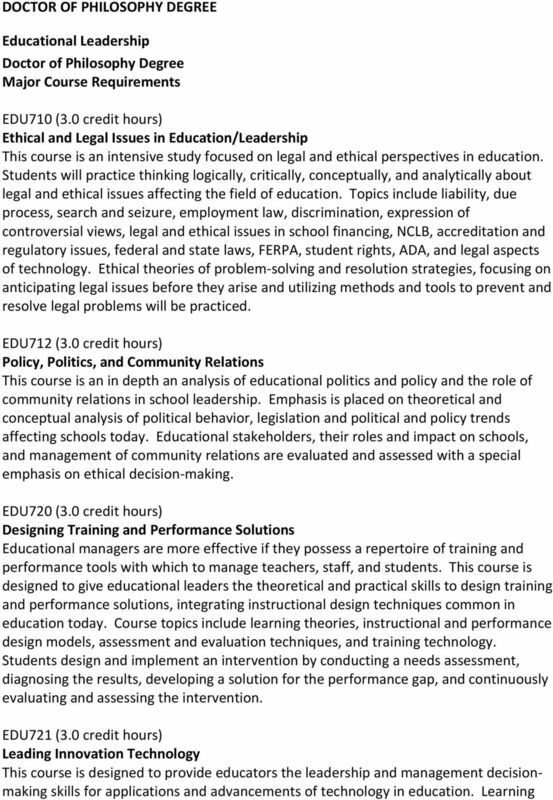 CORE COURSES NEDD 800 Professionalism, Ethics, and the Self This introductory core course will explore and interrogate ideas surrounding professionalism and professionalization. Research Guidelines for the Master of Science in Nursing Northern Michigan University College of Professional Studies Department of Nursing May 2007 Table of Contents Introduction.. 4 Project Options..